An International Karma Kagyu Conference was held in Kathmandu, Nepal, on16th and 17th of March, 2001. Delegates representing over five hundred monasteries and centers of the Karma Kagyu Lineage from around the world attended.The conference was expressly convened to address the present crisis within the Karma Kagyu lineage. A unanimous resolution was passed to declare our school’s determination to reject any interference from outside the Karma Kagyu lineage regarding the process of recognition and enthronement of the Karmapas and to protect the authentic transmission of the Karma Kagyu Lineage. own fundamental right to recognize the Karmapa, the spiritual leader of the lineage. This must be done in accordance with the genuine, spiritual custom of the Karma Kagyu lineage and without interference from outside the lineage. Traditionally the Black-Hat and the Red-Hat Karmapas have recognized and enthroned each other’s incarnations. History shows that the present crisis is rooted in the past. For centuries, the Gelugpa lineage of the Dalai Lamas and the Karma Kagyu lineage of the Gyalwa Karmapas have been locked in a struggle. The conflict started as early as the fifteenth century, at the time of the Seventh Karmapa and Fourth Shamarpa. This coincided with a period during which the Tibetan government was controlled by the Kagyupas. Hostilities peaked in 1638 when the Fifth Dalai Lama invited the Mongolian army under Goshir Khan to invade Tibet. The Gelugpa and Mongol alliance was subsequently responsible for the death by decapitation of virtually all abbots from one thousand Karma Kagyu monasteries. All these monasteries were converted to the Gelugpa order by force. 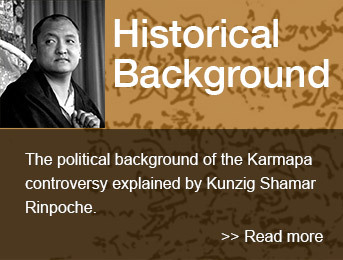 The Tenth Karmapa’s camp came under attack and over seven thousand of his monks were slaughtered. Only Karmapa and his attendant managed to escape. The Karmapa was forced to stay in exile for the next forty years. Two centuries later the struggle escalated further during the regency period between the Seventh and Eighth Dalai Lamas. Tenpai Goenpo, a Gelugpa minister, took the opportunity to permanently remove the Shamar Rinpoche from the religious scene in Tibet. In spite of having mediated in the war between Nepal and Tibet-China, the Ching-Emperor of China declared him a traitor and all his monasteries were forcibly converted to the Gelugpa order. An edict banning Shamarpa’s future incarnations was proclaimed. In 1959 came the demise of Tibet at the hands of the Communists. Unfortunately Tibet’s destruction seemed not to have been disaster enough to reign in the long-standing and unjustified aggression of the Gelugpa School towards the Karmapa and his Karma Kagyu order. In 1961 the Tibetan government in exile proposed to merge the four Tibetan schools into one religious body headed by Your Holiness. This policy inflicted serious spiritual suffering on much of the Tibetan exile community. Rallying behind Karmapa’s authority, thirteen Tibetan settlements challenged the Exile Government’s plan and as a consequence the whole scheme was abandoned. Later in the seventies Karmapa came under blame because he had chosen to defend the autonomy of the three other lineages. The aggressive atmosphere which had been fomented during that period triggered joyful celebrations at the Tibetan camps in Ladakh when H.H. the 16th Karmapa died in 1981. This painful incident further inflamed the mistrust between the two schools. Even before the 16th Karmapa’s death, members of Your Holiness’ circle had already approached certain high Kagyu lamas with an offer of collaboration in the search and recognition of the 17th Karmapa. In close cooperation with this traitorous Kagyu group, Your Holiness succeeded in dividing our school for the first time in its history. This scheme brought about the subsequent enthronement of a false Karmapa in China. In 1992 and 1993 Your Holiness deliberately endorsed the wrongful claims and actions of this group of corrupt Kagyu lamas. This interference is absolutely unacceptable to the Karma Kagyu School. In July 2000, Your Holiness’ involvement in the matter went even further. Your Holiness informed H.H. Shamar Rinpoche in writing that even if an authentic prediction from the 16th Karmapa was found and presented, it would not sway your insistence that Urgyen Trinley is the Throneholder-Karmapa. By doing so Your Holiness would retrospectively deprive the undisputed 16th Karmapa of his right to determine his own reincarnation. Such a preposterous claim goes against the Karma Kagyu tradition and sets the stage for a take-over of the Karma Kagyu School by Your Holiness’ School and Government. Up until Your Holiness’ interference in 1992, no other Dalai Lama has ever played a role in the recognition of a genuine Karmapa. As Your Holiness well knows, the Karmapa incarnations precede the Dalai Lama line by over three hundred years. There is no historical precedent for Your Holiness’ current involvement. We highly respect and support Your Holiness’ struggle for the welfare and freedom of the Tibetan people. We therefore request you to apply the same goodwill in the case of the Karmapa controversy. For the sake of the integrity of our lineage, we urge Your Holiness to gracefully bow out of this internal conflict of the Karma Kagyu School. We also ask for Your Holiness’ support regarding our view that the whole world will benefit by preserving the rich diversity of all four schools, including the Karma Kagyu. We sincerely make wishes for Your Holiness’ long life and continued health.